I admit it. 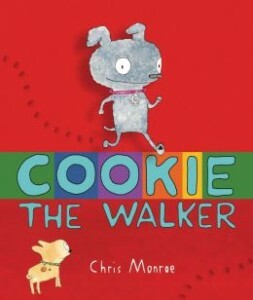 I’m a sucker for subtle, dry humor, and I’m a big fan of Chris Monroe. In the tradition of Sneaky Sheep, the new book will have second graders as well as grown-ups giggling and wanting more. Cookie is an ordinary dog, except she walks on two legs. The advantages are many. She can look out the window without getting on the furniture. She can turn on the television. She can reach the icemaker. Her talent draws more attention than Cookie and her buddy, Kevin, can handle. She is hired first by Beatrix Havior of B. Havior’s Behavior Barn to star in a dog show. Cookie performs many tricks and even walks on a flaming board across a kiddie pool filled with snapping turtles. She works for snacks. Next, Pierre La Toot of Cirque De La Toot shoves Kevin aside to hire Cookie for circus peanuts (snacks). Television producer Stu Spoon comes next with a fanny pack, mini fridge, and more snacks. Among other things, she dances with penguins and interviews ghosts. Cookie mostly ends up overworked and over-snacked. So she starts walking like a regular dog again, unless there’s no one around and she sees bacon or an extra-fluffy towel. The silliness of both the text and illustrations make this a winner, drawing in many readers. But the themes of using your talents and the value of individuality provide many opportunities for reading activities. Parents and teachers may want to use this as a read aloud for younger children, so they can discuss those themes.